Of all the silly bible related movies of the past decade or two, Risen may be one of the least silly and watchable. 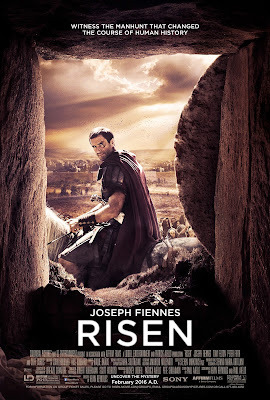 Risen is a film intended as a mystery/thriller and "unofficial sequel" to The Passion of the Christ (2004) set to depict the events surrounding the 40 days following Christ's resurrection, in a script written by Paul Aiello, as told from the viewpoint of Roman military tribune Clavius (Joseph Fiennes) ordered by Pontius Pilate to investigate growing rumors of a risen Jewish messiah and to locate the missing body of Jesus of Nazareth in order to quell an imminent uprising in Jerusalem. In the first half of the movie we follow Clavius, who has been serving 25 long years in the army and is now ready to settle down in retirement in hopes of living at least one day without seeing death. Before this can be, however, Pontius Pilate summons him to investigate a "theft" of the body of Jesus, allegedly by his disciples, as well as misconduct by the Roman guards he set watch over the sealed tomb of Jesus. The initial parts of the investigation are the strongest part of the movie, leaving you to wonder how Clavius will come to a conclusion of his investigation. But the fact that we know this investigation will come to a positive conclusion leads this movie downhill quickly. It is obvious from the beginning that the film is one-sided, therefore what makes it strong by its method of rational investigation leads the writer of the script to take a lazy way out and just have Clavius walk in on the disciples while Jesus is present and about to reveal himself to doubting Thomas. All the investigating is thrown out the window by just making Clavius a believer vicariously through Thomas and an honorary disciple. The disciples themselves are presented somewhat as annoying frat boys, though there is a moving scene or two if you allow yourself to get caught up in the story. As the movie progresses the disciples mellow out a bit, but not totally. It seems the only solemn display in the entire film is made by Joseph Fiennes, who carries this movie with his exceptional acting ability, allowing it to be decent at times. Risen would have been a lot stronger if it was an animation. There is no exceptional filmmaking, and it often presented itself as cartoonish. It at least would have been more interesting if it were more creative and less obvious and went much deeper into the investigation of the alleged resurrection, without taking the easy route and having Clavius just happen upon Jesus and calling off the investigation. To have found faith through the investigation itself, or perhaps through the disciples after Pentecost, would have made this a much better and believable story, and less silly. It also would have made it more relatable to the modern viewer. Because by the time the movie is over, it leaves you wondering what the point of the movie was. You go in thinking this is a movie about investigating the resurrection, but halfway through the movie the investigation comes to an abrupt end. And when Clavius finally has an opportunity to have a conversation with Jesus, the only thing he seems to get out of the encounter is what he was initially looking for by retiring, which is basically a day without seeing death. The viewer however is left empty and with nothing, because the film fails to make Clavius one of us. If I were to recommend better movies that are more successful at giving what Risen failed to give, I would recommend Ben-Hur, The Egyptian and The Fourth Wise Man.